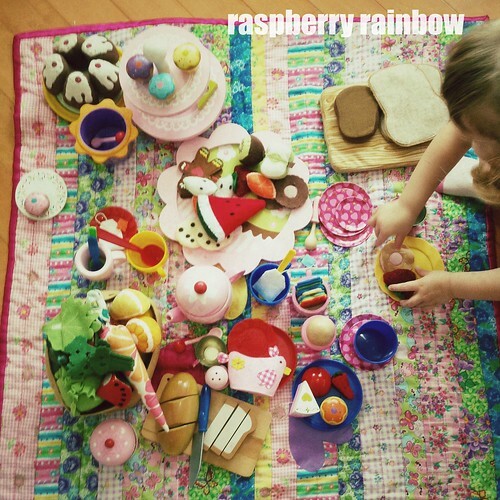 Raspberry Rainbow: Sausage rolls, quilts and ideas. And a picnic or two. Sausage rolls, quilts and ideas. And a picnic or two. We are back in Hong Kong, it is always wonderful to be home after a trip away, especially after a long one. Don't get me wrong, we had a lovely time away, but I missed my sewing machine and crafting time. Abbey has started school again. Zoe will start kinder in a few weeks. We are getting back into our routine. Cooking: yummy pasta salad. I made enough to have it as left overs one night, so yay, a night off cooking. Sewing: I have started another quilt, one for the Shropshire boy this time. I'll share some photos soon. I may be a little obsessed with it, no other sewing is happening. Playing: with Zoe, lots. Play picnics, colouring in, puzzles, reading books. She is missing Abbey now school has gone back. Opening: My Etsy shop is now open again. I have so many new ideas in my head and written down. I better finish this quilt for the Shropshire boy pronto, then I can start on a few of these new ideas. How is your week looking? Good I hope. I love your bright photos! And while a holiday is nice, it's good to be home with your things, and with a routine again. (And not staying with other people!) Welcome home. Hi Kat...it was interesting to note that HK is really 'home' now. All the best in getting all those new ideas translated into reality and the shop. The picnic spread is fantastic! Lovely to here you're settled back again, and that you enjoyed your trip! That picnic spread is awesome! My week is definitely not as busy as yours!! My kids are back at school next week so we are just taking it easy and enjoying our last few days of freedom. But to be honest the routine of school suitsme much better and I'm looking forward to having a lot more time for my crafting.